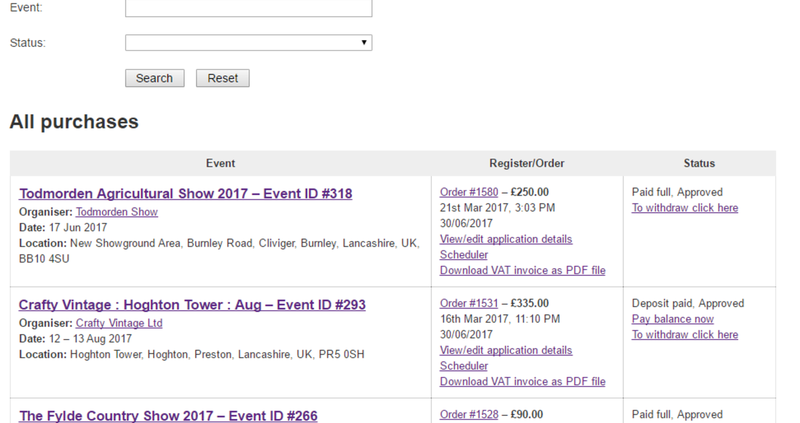 Once you have sent off your first application; your application form, your order and its status, can be found under the Exhibitors tab on the top navigation bar in the purple zone. The Purchases area is the work horse of your dashboard. You need to click on Purchases seen here below to access your trade stand application information. We keep a record of the events you've applied to via our system, flag up any issues with card payments, provide the facility to withdraw from an event (see further on this under 'Withdrawing from an event'), pay a stand fee (early if you've paid a deposit) and issue sales receipts for you to download at your convenience. You can also open and download a spreadsheet of your financial information in three spreadsheet formats. Sales Receipts are only issued after your payment card has been validated and processed. Like any sales receipt only when the order has been paid in full will it show a Paid Full status. Otherwise Deposit paid is shown. If we encounter any issues processing your card we will both email you and if not settled quickly, we'll flag this up to the event organiser concerned. Need to add to an order? If you DO need to add to your order, you must treat this as either a full reapply and withdraw your old application (this maybe subject to the terms and conditions of Event Owl and the organiser), or just send a new order for the missing items. This is because the card information is only for the order you sent, and was calculated only for that transaction. Discount/­Promotion codes can only be used once at check out,so the organiser would need to issue you a new code. Make sure our info@­eventowl.­co.­uk and accounts@­eventowl.­co.­uk are not going to your spam box! See our FAQ's if you encounter a card error.